Singer/songwriter Loi Head performs at the 13th Annual DeLand Original Music Festival. "It definitely brings up a lot of questions ..."
For Loi Head, music has always been a part of life, even in the early years. Her mother and grandmother sang to her as a child. Her older sister was a singer, and may have been the inspiration for her joining chorus as a young student. 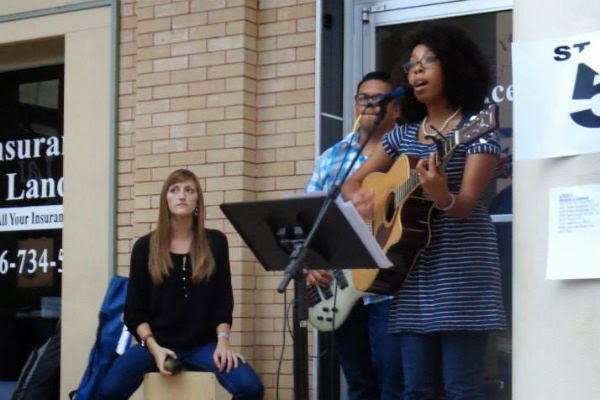 In college, Loi joined a worship team and sang back up vocals for a campus ministry. This got her around musicians, and after college she picked up the guitar and started to learn. The decision to become a full-time musician came after the encouragement of others piqued her interest. "Several people had just randomly talked to me about that," Loi says, "which I had never thought of before on my own, like, oh, I should be doing this. So then words of encouragement got me thinking about it, and then picking up the guitar and learning that kind of flowed together. I would be practicing and just thinking about words and songs and melodies and everything kind of coming together. So just through writing songs, even when I wasn't proficient at the guitar, made me want to do it even more." Loi admits that being a full-time musician has changed her life, but mostly for the better. "It definitely brings up a lot of questions ... also, it's changing my life by, it's creating a platform and a space to encourage not only myself but others. 'Cause a lot of the songs I write are just to encourage me on this journey and others on a similar journey, and it doesn't have to be in the field of music, it could be anything. Also making me more humble and having to rely on others, vulnerability — all these things that I would have never thought come along with being a musician. I guess right off the bat you don't just automatically think of those things." It has also influenced her message, which is inspiring others not to feel trapped in their lives as they are. "It's so easy to do. It's so easy to listen to other people and negativity. So just encouraging others to get out of that, to not listen to what people may be saying, and also to tell stories that help people move forward and make sense of the world even when it doesn't make any sense," she laughs. Loi says her musical style is still evolving, but she currently considers herself an indie-pop, soul artist. Her future plans are to continue writing and collaborating with other musicians. She is also looking for a regular gig in the Orlando area. You can follow Loi's progress on Facebook, Twitter, and ReverbNation. She will be performing in Orlando at Sterling's Acoustic Club at The Peacock Room on Wednesday, July 16, at 9:30 p.m., and as a part of Lynx Central Station's Tunes in the Terminal on Tuesday, July 29, at 11:30 a.m.
Are you a full-time musician? What challenges have you faced in your career? Comment below and share your thoughts. And don't forget to subscribe for more perspectives on pursuing life outside the box.